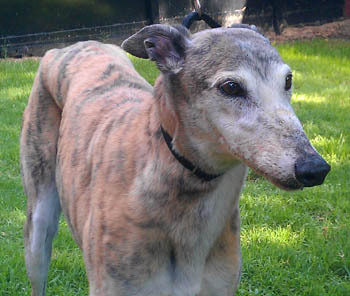 Silvia is a beautiful, 10½-year-old brindle female. She is untattooed, but we were told when she arrived that she was born in June 2002. Silvia and Sammy are littermates! This sweet, little ol' gal is ready for a home of her own and how can anyone resist that face? Silvia is cat trainable and is getting along fine with a small dog in her foster home. Sylvia is an absolutely lovely companion. She gets along well with our other two hounds and totally ignores our two cats. Even when the cats chase her and swat at her, she just ignores them. There is no need to crate her while we are gone. She has never had an accident or done anything remotely destructive. She is an inside girl. Only likes to spend enough time outside to do her business and she wants back in the house. Normally she heads straight to one of the slumberball dog beds. She eats well at breakfast and dinner. 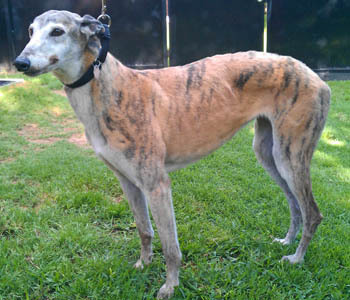 She has a beautiful, calm spirit and would be perfect for a "first time" greyhound parent. She absolutely loves her evening walks with her foster sister. She walks well on a leash and loves to explore the neighborhood. She does well with other dogs at Meet and Greets. With her being a bit shy, she probably would like some canine companionship but would probably be fine as an only dog. Sylvia is such an easy going girl, we thinks she is a true gem.